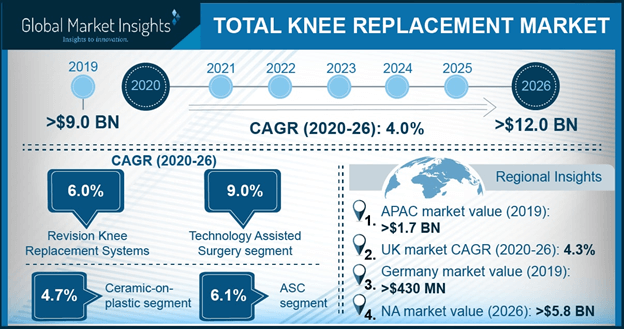 Total Knee Replacement Market Report « Global Market Insights, Inc. The commercialization scale of total knee replacement market seems to have gained an unprecedented momentum, of late, owing to the rising prevalence of chronic bone disorders such as rheumatoid arthritis and osteoporosis in geriatric population globally. As per the statistics released by International Osteoporosis Foundation, a Switzerland based global alliance of healthcare professionals, research organizations, patient societies, and international companies, osteoporosis causes more than 8.9 million fractures annually across the world with an osteoporotic fracture being recorded every 3 seconds. In addition to such an overwhelming number of patients suffering from bone degenerative disorders, the technological advancements in customized implant material has emerged as one of the major factors driving total knee replacement industry trends in the recent years. Speaking along similar lines, there has been a considerable shift in patient preference from conventional surgical procedures toward technologically-advanced minimally invasive surgeries. Drastic improvements in the accuracy and precision of surgical procedures being carried out in the recent years have proved to be instrumental in propelling the growth prospects of total knee replacement market on a global scale. Moreover, numerous prominent medical device manufacturers have increasingly focused on launching an assortment of new applications that are augmenting the efficiency of existing surgical tools. Smith & Nephew for instance, announced the expansion of its NAVIO platform to total knees by unveiling NAVIO handheld robotics-assisted total knee arthroplasty (TKA) application last year. The latest application supports various knee replacement systems such as GENESIS II Total Knee Systems, LEGION Primary, and JOURNEY II. Additionally, the TKA application lowers the cost of surgery and allows patients to receive the benefits of robotics-assistance without going through preoperative imaging procedures such as CT scan. Furthermore, the application has been garnering considerable attention across total knee replacement industry as it provides an efficient and streamlined workflow along with thorough manuals that guide handheld robotics-assisted surgeries. Apparently, the advent of such next-gen applications equipped with robotic-assisted systems is certain to assist total knee replacement market acquires a commendable presence in the healthcare and medical devices space in the ensuing years. Speaking in terms of the product landscape, the total knee replacement industry accrued an excellent revenue of close to USD 3.9 billion from the partial knee replacement surgeries in 2017, as per reliable estimates. This amounts to a humongous 49 percent of the total remuneration portfolio of the total knee replacement market during that year. Owing to its many advantages such as replacement of only the damaged portion of the knee along with a spurt in the development of customized implants that ensure minimal erosion of healthy tissues, partial knee replacement surgeries are being increasingly preferred by healthcare professionals and patients alike in the recent years. In this regard, it would be prudent to cite the instance of the recently launched water-resistant X3® Advanced Bearing Technology by one of the foremost medical equipment manufacturers, Stryker Orthopaedics. Reportedly, the new premium bearing technology has achieved a significant 96 percent wear reduction than the current leading implants available on the total knee replacement market. For the record, the firm is one of the major providers of partial knee replacement implants across the globe. The technology would improve the longevity and efficiency of new implants that are anticipated to be developed by Stryker in the near future. Apparently, the incorporation such high-grade tech innovations in implants is certain to reinforce the position of partial knee replacement segment in the overall product landscape of total knee replacement industry. Lately, the prevalence of chronic bone degenerative disorders such as osteoporosis and rheumatoid arthritis has been on the rise in the younger populace as well. As per reliable estimates, more than 600,000 residents of the United States have knee replacement surgeries annually and around half of these patients are currently less than the age of 65. It is being stated by trusted sources that the number of knee replacement surgeries is anticipated to surpass 3 million each year in the U.S. by 2030. These statistics aptly demonstrate the business opportunities for the total knee replacement market in the developed economies across the globe. In fact, as per a research report compiled by Global Market Insights, Inc., the overall revenue share of the total knee replacement industry is slated to exceed the USD 10 billion-dollar benchmark by 2024. This entry was posted in Healthcare & Medical Devices, Uncategorized and tagged Total Knee Replacement Industry, Total Knee Replacement Market, Total Knee Replacement Market Analysis, Total Knee Replacement Market Growth, Total Knee Replacement Market Outlook, Total Knee Replacement Market Pdf, Total Knee Replacement Market Price, Total Knee Replacement Market Report, Total Knee Replacement Market Share, Total Knee Replacement Market Size, Total Knee Replacement Market Trends.